Guest blog from Richard Dee: What is Steampunk anyway? Posted by Jenny Kane on Oct 26th, 2017 in Blog, Fiction, Jenny Kane, Steampunk | Comments Off on Guest blog from Richard Dee: What is Steampunk anyway? 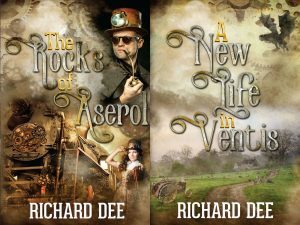 It’s my pleasure to invite friend, fellow author, and member of the Exeter Author Association, Richard Dee to my site today. 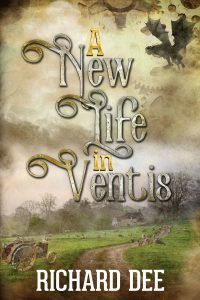 Richard’s latest book, A New Life in Ventis is available on pre-order now! Thanks Jenny for the invitation, now a few of you might be wondering what a Steampunk author is doing here, plugging his next work. Aren’t we straying a little off-piste? And what is Steampunk anyway? There are many interpretations of the genre, here’s mine. Picture a world, a world without oil, without electricity. Imagine a place where the steam engine is King, driving vehicles and industry. Where portable power is provided by clockwork engines; powered by coiled springs. It’s conventional to depict this world as Victorian, because it gives us a reference point, it’s the nearest we can get in our experience. And let’s be honest; the costumes are pretty cool too! But when you think about it, if oil and electricity had not been utilised in our society, where would our Victorian’s be today? Could we have vast aircraft, with jet engines powered by coal gas? Could we have clockwork computers, printing onto paper? Or mechanically driven moving picture shows? Of course we could, and so much more. Who knows what else might have been invented by necessity? And what are the limits of the technology? Might the world even be a better place? That’s an awful lot of questions in two paragraphs. So you could say that a Steampunk world is really just a different us. Even though I called my Country Norlandia, it could just as easily be an England that went in a different direction. And as it’s us, the people in my world are no different to the people in Jenny’s or anyone else’s stories. They have the same emotions, the same vices and the same tales to tell. 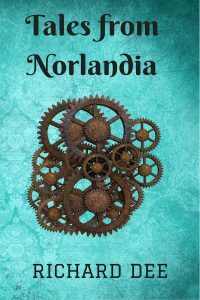 My fictional world of Norlandia and the stories set there have romance, corruption, revenge, heroes, villains and all the other elements of any adventure, the only difference is that they are set against the background of smoking chimneys, coal dust and the whirring gears of fantastic machines. The technology is a character, not the main event. In the same way as a village or a beach, or even, dare I say it, a coffee shop? Once I started creating the world, I realised that I could adapt a lot of what we have today and invent new ways to make it work differently. By keeping it practical and useful but just slightly ‘not the way it’s done here’ it enhances the difference in the setting. Things like the gas powered jet engine, it’s perfectly possible but not quite how we do it. And you can also have fun creating those little bits of back story that give the place its atmosphere, like the suggestion of myth and magic in exotic foreign lands, the novelty of Cofé and how the lack of instant communication makes people behave differently. Anyway, if you wanted to learn the intricacies of Fantasy World building you wouldn’t be here, I’ll get back to the story. A New Life in Ventis, the novel I came here to tell you about, is the second one that I have set in Norlandia. It follows the further adventures of Horis Strongman, an ordinary person who finds himself thrust into extraordinary circumstances. He’s a city boy, naive and out of place in the country. Luckily he finds a feisty sidekick in Grace, and then there’s his new friend Maloney, an ex-soldier with a mechanical arm and a dislike of authority, to keep him safe and on track. 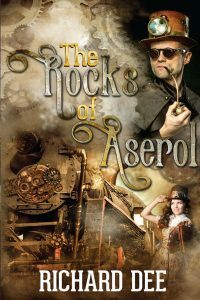 In the first book, The Rocks of Aserol, published in 2016, Horis is the unwitting pawn in a conspiracy. Sent to be the expendable minion, he discovers a secret, falls in love and is rescued from the fate his unscrupulous superiors intended. He sets off to make things right. A reviewer commented: – There’s something of a ripping yarn about this excellent tale of adventure. False accusations, discoveries kept secret, villains who murder to get their way, and the whiff of requited love – it’s all here in this classic steampunk saga. That story was complete, or so I thought, I moved on to other projects. Then I started getting requests to continue the adventures from readers. One said, so, what becomes of the hero? All I’ll say is, the story does have an end but there are still questions unanswered. I think Mr Dee would disappoint quite a few readers if he didn’t come up with a sequel – or better still – a series. And another commented, I absolutely adored it but the ending!!!!!! What’s going to happen next? Please tell me you’ve written a sequel. Seeing those remarks made me wonder, what could happen next? I knew that I had to continue the story; A New Life in Ventis was the result. In the second book Horis experiences the joy of reunion, he discovers that the bad guys are still out to get him and will stop at nothing in their pursuit. He also learns…, well that would be telling. And, if my editor is to be believed, there needs to be a third part to the tale as well. There are certainly enough possibilities, enough machines and fiendish adversaries to justify many more adventures for Horis, Grace and Maloney. And who knows, maybe Horis will find the quiet life he craves. We will have to see what happens; the creation of the world so far has already resulted in an alarming amount of research and invention. Sufficient to make a book of short stories, Tales from Norlandia, which; incidentally, is now available exclusively from my website. Here’s a chapter from A New Life in Ventis to give you a flavour of the story. Sayrah Faith was unused to flattery. So that when the stranger leant over the reception desk in the Provincial Hotel and complimented her on her appearance; she was unsure just how to reply. Flustered, she put her hand to the side of her head, patting her tightly wound hair. “Oh sir, you should not,” she answered breathlessly, unaware that her normally well-hidden feminine instincts had made her react in the same way as the girls she considered ‘flighty’. The cheap novels she read so avidly described such situations as this, but she had never been part of one herself. She found that she quite liked the sensation it produced. It was just as the novels had described it. “How may I help you?” she asked, attempting to strike the sort of pose that ‘heroines’ did. In her bone corset and tight gown and with her stomach sucked in she found the posture uncomfortable. Still, she reasoned, it might be worth holding it for a while longer. “I’m looking for a room,” the man replied. Sayrah was on safer ground here. She pulled the pencil from behind her ear and automatically licked the point. Then she thought that perhaps she should not have done, as the man’s eyes widened. Flustered again she opened the ledger and ran her finger down the page. “We have a single available,” she began but the man shook his head. He was tall and thin, with a heavy moustache and side whiskers yet had an air of mystery and excitement about him. Sayrah was unworldly; in her mind she could hear her mother’s voice. ‘Double beds are only for marriage and the worst kind of adventures,’ she had used to say. Sayrah had never been a party to these ‘adventures’ and although she was aware of their nature had never been in a position to experience them. In her life thus far, men had treated her at best with indifference, it was because of her plainness and larger body she was sure, but this man had a twinkle in his eye and a kind face. Perhaps he was what the novels referred to as ‘the one’. “I couldn’t say,” she blurted, then realised that wasn’t the right answer for a worldly wise woman to give. She blushed but the man never noticed. Maloney was sat in the porter’s office, close to the desk, reading a news-sheet, his ears pricked up at the conversation. Sayrah was unable to hear the insincerity in the stranger’s voice and he did not like to think of her being gulled by a stranger. And there was another possibility; this may be an attempt to elicit information about Horis and Grace. Since he had returned to work, Maloney had been alert, waiting for such a moment, he had no doubt that Terrance would seek Horis and Grace out for revenge and he wondered if this was just the start of things. Sayrah was an easy target for an unscrupulous agent after all. He merely needed to flatter her and she would be his. Maloney put down his sheet and crossed to the door, to better hear what else transpired. Maloney’s office was between the desk and the speaker room; he busied himself as the man passed then went to the other wall and listened carefully. He could hear the man on the speaker as he called the operator. But instead of asking for the eatery, he heard him ask for a number in Bingham. That was a town halfway to Metropol City. That alone served to warn him that his suspicions might be well founded. There was a space while the other party replied, Maloney could not hear the words but guessed that the man was speaking to Terrance, or perhaps some representative of the government. Again there was the silence. “Very well,” the man said. “I will report to you again at this time tomorrow, assuming that I survive the night.” Maloney heard the click as the call ended, then the noises as a second call was quickly made and a table at the eatery was booked. Maloney stretched and straightened, peering through his door he saw the man speaking to Sayrah; no doubt he was confirming their meeting. A New Life in Ventis will be released on November 1st 2018 as an eBook and paperback. Many thanks for dropping by today Richard, and for sharing such a great story. Good luck with your new release!